An understanding of the requirements and opportunities in maintenance, good safety practices, pride in workmanship, and an understanding of the principles and accepted practices of the maintenance trade are covered in this program. Students are trained to hold positions in factories, hospitals, hotels, etc., where multi-skilled maintenance personnel are needed. Included are courses in air conditioning, carpentry, electricity, machine tool, metal fabrication, and welding. 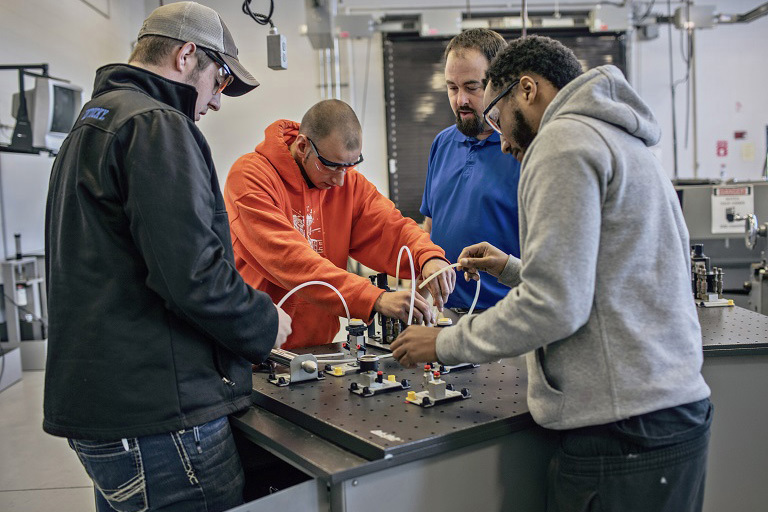 Progression in the Industrial Maintenance Technology program is contingent upon achievement of a grade of C or better in each technical course and maintenance of a 2.0 cumulative grade point average or better (on a 4.0 scale). For program course requirements, click on links above for the MIT: Industrial Maintenance Technology Check Sheets. Applicants with broad skills in machine repair and maintenance should have favorable job prospects. Many mechanics are expected to retire in coming years, and employers have reported difficulty in recruiting young workers with the necessary skills to be industrial machinery mechanics. In addition to openings from growth, most job openings will stem from the need to replace workers who transfer to other occupations or who retire or leave the labor force for other reasons. You can complete the Associate in Applied Science in two years as a full-time student pending no developmental needs. Certificate can be completed in less time depending on your class load.